Buffett wrote that government leaders have asked for “shared sacrifice,” but he, along with other mega-rich have been “spared,” in New York Times feature article. The chairman and chief executive officer of Berkshire Hathaway Inc. has appealed to Congress to increase taxes on the country’s wealthiest in an effort to cut the U.S. budget deficit. According to Buffett, people invest to make money and potential taxes have never been a deterrent. The unemployment rate in the U.S. has averaged 9.5 percent over the past two years, falling to 9.1 percent in July from 9.2 percent in June, a report showed on August 5. The 80-year-old investor said that his 2010 federal tax bill, including payroll and income taxes, was $6,938,744. 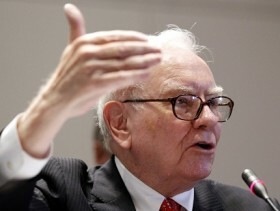 Buffett wrote that although it sounds like a lot, he only paid 17.4 percent of his taxable income. That number is lower than what the other 20 people in his office pay. Buffett said their federal tax bill ranges from 33 percent to 41 percent and is an average of 36 percent of their taxable income. The tax burden on the nation’s wealthy has fallen over the past two decades, according to Internal Revenue Service data that Buffett cited. He wrote, in 1992 the 400 top American earners paid federal taxes of 29.2 percent on $16.9 billion. However, in 2008, their aggregate income spiked to $90.9 billion, but the tax rate had fallen to 21.5 percent. Buffett stated that the members of Congress need to take “action that is immediate, real and very substantial,” because Americans are quickly losing faith in the government’s ability to fix the U.S. debt problem. The billionaire investor suggested an immediate increase in tax rates for households making an excess of $1 million, including dividends and capital gains. He adds that for those making $10 million or more, there should be an additional increase in tax rate. On August 2, Congress raised the country’s debt ceiling in order to avoid a possible default and put a 12-member panel in charge of finding $1.5 trillion in budget cuts over the next 10 years. Co-chairs of this “super committee” are Republican Jeb Hensarling and Democratic Senator Patty Murray. The other committee members include Democratic representatives James Clyburn, Chris Van Hollen and Xavier Becerra, joining their Republican counterparts Dave Camp, Fred Upton, and Jeb Hensarling. The Senate team includes Republicans Jon Kyl, Pat Toomey, and Rob Portman and Democrats Patty Murray, John Kerry, and Max Baucus. 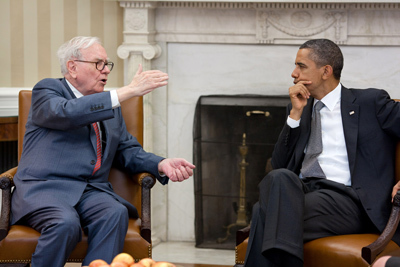 Posted on August 17, 2011, in News and tagged Berkshire Hathaway Inc., Congress, Debt, New York Times, Obama, Tax payers, Warren Buffet. Bookmark the permalink. Leave a comment.